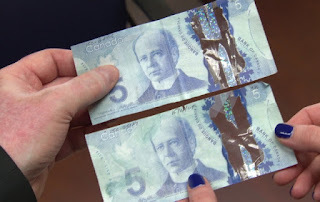 Canada's plastic money is stumping counterfeiters. The RCMP estimate the number of fake bills passed on to retailers in 2015 dropped by 74 per cent compared with the previous year. That doesn't mean people have given up trying to copy Canada's banknotes — it's just that even their best attempts to make fake cash are falling well short. Regina Police Const. Scott Wolfe hasn't seen much counterfeit currency since the Bank of Canada introduced polymer money four years ago, but he did have a case last fall. "When we first touched the bill you could tell it wasn't the polymer feel. It was paper. We could see they had cut out the security window from a real $5 bill and pasted it to a $50 and $100 bill," said Wolfe. The face in the hologram didn't match the face on the bill and the edges were uneven. Even so, the money was successfully passed on to retailers, perhaps in a dimly lit bar or sandwiched between two authentic notes. Wolfe said people passing counterfeit bills often pay for an inexpensive item with a high-value bill in order to get lots of change in authentic currency.